July 2015: In our June briefing we focused on the opportunities and challenges of navigating tomorrow’s digital landscape and digital transformation for businesses. This month our perspective shifts to the consumer, while in August we will put the spotlight on governments. Transformative digital technologies are changing life around the globe at an unprecedented speed. New products, services and platforms are giving people more choices than ever before. With more choices comes more power and freedom to take control of our personal lives, work, political, religious and social affiliations, and consumption patterns. However, it also means figuring out how to use all these choices in an effective and progressive way – the world and each of us as individuals are only at the start of this process. It means understanding what are the new channels to market – and how best to use them. It also means shifting our behaviors and attitudes as smart devices radically change how, for example, we work, communicate, purchase, source entertainment and knowledge, as well as manage our health and daily lives. In this environment, businesses and channel intermediaries face an increasing threat of losing direct relationships with the consumer or customer. Retailers are facing a digitally driven perfect storm as connectivity, rising consumer influence, time scarcity, mobile payments, and the internet of things are changing where, when, and how we shop. Social media platforms are facing a privacy backlash. Financial services providers are getting squeezed out by peer-to-peer networks, mobile phone operators and retailers, to name just a few new competitors. Consumers have never been savvier, more demanding, value conscious, and connected. But bear in mind that while today’s consumers are almost always connected, future consumers will most likely be always connected as digital technologies become wearable and even implanted in the body. Let’s have a look at how connected consumers really are and how to engage with them in the future. The world’s consumers are living and breathing technology and there is no sign of it slowing down. The internet has become a 24/7 activity and the world is so digitally connected and full of information that choices can sometimes be overwhelming and opaque. While the target is to get everybody on Earth connected to the internet this is still far from a reality. Today, around 40% of the world’s population is connected to the internet with Europe (75%) being the most connected and Africa (19%) the least connected. 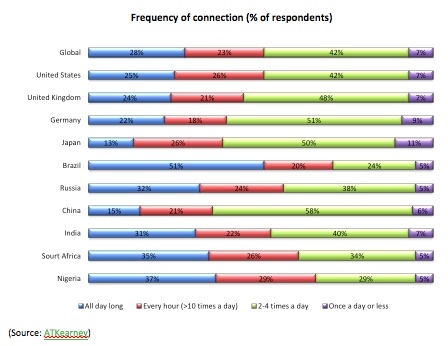 The chart below highlights how often the world’s consumers connect each day. A global survey from Accenture reveals that 37% of consumers now own a combination of smartphones, laptops, desktops and tablets. It also found that 16% of consumers own a connected TV, in addition to a combination of these other devices. These devices are used to access all kinds of content on a daily basis. New channels and technology platforms have radically changed how consumers interact with brands and how brands in turn communicate with the consumer. The digital age is also rewriting the rules of how consumers behave. In the connected world there is always another opportunity: Brands must tread warily and listen to what the consumer wants from a digital experience to become a part of this new ecosystem of intuitive information. You never get a second chance to make a first impression and if brands get it wrong they most likely do not get to engage the consumer at all. 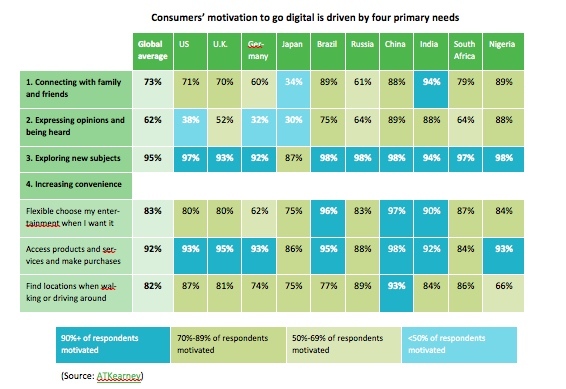 The table below highlights why consumers are motivated to go online in a digital world. Make it Personal: It is still all about “Me.” Consumers love personalized and/or customized products, services and information. Standard goods, services and information are no longer sufficient to attract and retain consumers. In an age of information overload, mass communication and advertising are tiresome; consumers demand personalized/individualized, unique and relevant content, products and experiences from brands and information providers. Make it easy: Intelligent devices are increasingly popular among consumers – but 83% of them find it hard touse these devices right out of the box. 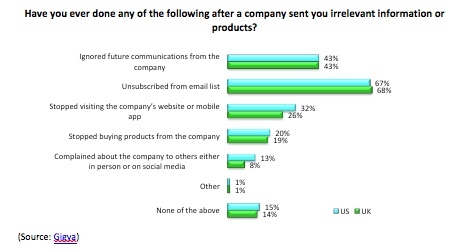 An Accenture survey suggests that 21% of respondents found them too complicated to use, 19% struggled to set them up, 19% discovered that they did not work as advertised, and 19% could not connect them to the internet. A notably high percentage of consumers had challenges using wearable health devices. All this should be distressing news for brands! The number one factor in the purchase decision for intelligent devices is namely ease of use (33%), followed by features and functionality (29%), trusted brand (28%), design – look and feel (18%), compatibility with existing owned devices (16%). Trust and ethics in a digital world: Organizations are collecting vast amounts of data about consumers to build accurate profiles that can improve marketing effectiveness, while some even resell the data. It is therefore critical that consumers can trust businesses to protect their personal data. But it is not easy. Keeping customer data safe from cyber-attacks is an increasing headache for many organizations, e.g. data breaches at Target, IRS, Neiman Marcus and several banks around the world. Ethical concerns are also rising, although many organizations only pay lip service to addressing issues including: Is selling data to a third party ethically correct? Who owns the data? 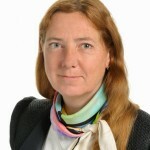 Who should control it – the consumer or the organization? In this relatively new world of digital data it is critical that organizations of all types and governments around the world understand and address the risks associated with data collection. What’s next for the always connected, digital consumer? Digital technologies have already changed consumer demands and behaviours, delivering a world of opportunities for companies to engage the consumer around everything from special deals, to product launches. These innovations show no sign of slowing down, with retail stores, brands and organizations offering new ways to enhance the consumer experience through, for example, beacons, virtual changing mirrors and augmented reality apps. Looking forward, the world of the always connected consumer will see physical and digital worlds converging – demanding that those businesses wishing to serve them stay ahead of the technologies that will enhance the customer experience through convenience, service and personalization. Beacons for convenience: Indoor spaces sometimes block cell phone signals rendering location services on mobile phones pretty much useless. Bluetooth Low Energy Technology or beacons offer a solution. Beacons can now detect how close a smartphone is to within inches. A new twist on location awareness, retailers are already starting to use beacons to provide customers with product information, flash sales, personalized deals and coupons as well as to speed up the checkout process with fully contactless payment systems. However, beacon technology goes beyond retail. Check out this link to where else it can be deployed. (Sources: Payment Source, Business Insider). The question is whether the consumer thinks this trend is cool or just creepy?